This week we discussed the dangers of pesticides and the need to use bug spray and how to use insect repellent safely. Here is another option. You can make insect repellent out of herbs. Herbal insect repellents work. They can help keep flies away from the dinner table, fleas off pets, ants out of the kitchen, moths from eating woolens, and mosquitoes away from your skin. Make an herbal oil using pennyroyal, rosemary, and tansy with a light vegetable oil such as soybean or safflower. The strong fragrance of the herbs it the key to deterring insects. Finish off the lotion by adding at least a teaspoon of purchased essential oil of citronella. Label the lotion and store in a dark, cool location. Rub the lotion on your skin when you venture into insect-infested territory. You can rub it on your clothing or onto a bandanna too. Just don’t put the lotion on good clothes since the oil will leave a stain. This book includes everything you need to know about growing your favorite herbs using safe, natural, all-organic methods. 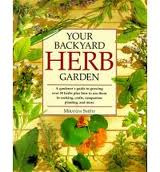 Included are practical tips and advice on all aspects of successful herb growing. A wealth of great ideas and helpful how-to on using herbs in cooking, crafts, cosmetics, health care, insect repellents, and more. Illustrated herb directory featuring all the most popular herbs– from aloe to yarrow– each with complete information on growing, care, harvesting, and uses.